Today, I discovered Blog Networks after reading Sarah Parez’s posting “Blog Networks like MyBlogLog for Facebook” on ReadWriteWeb. Blog Networks is a new Facebook application that allows you to embed your favourite blogs (including your own) into your Facebook profile so that your friends can read and rate your thoughts and the thoughts of others that you value. An interesting feature is that the easiest way to claim ownership of your own blog is to get your friends to verify that you own it which is both a social and viral way of getting the word out. 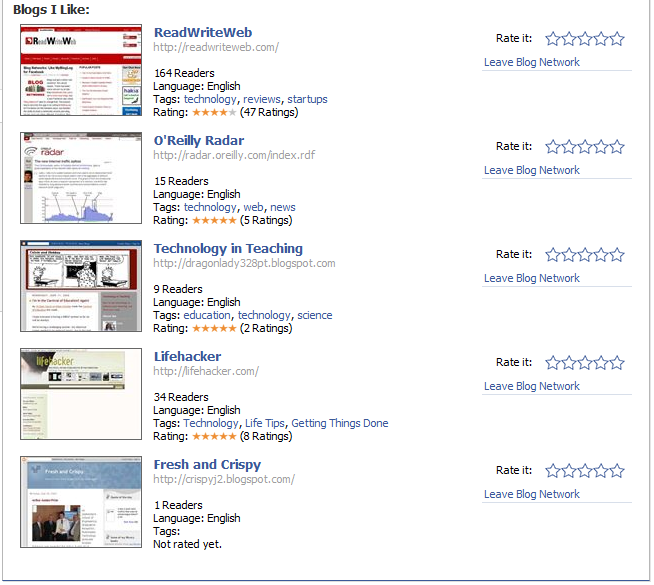 The picture illustrates my set up with ReadWriteWeb, O’Reilly Radar, Technology in Teaching, Lifehacker and of course Fresh and Crispy. Blog Feeds comes with a set of popular widely read blogs to choose from and you can easily add your own or other people’s. Presumably, friends see and can comment on the latest articles in your minifeed. If nothing else, it’s be a useful way to share RSS feeds without mentioning RSS! Josh Bloch on the new Effective Java book. There are lots more talks to view and lessons to be learnt, and it’d be great if more big companies and conference organizers did this sort of thing.